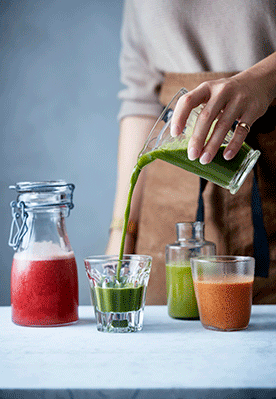 There’s something seriously refreshing and satisfying about juices and smoothies. These are, however, not designed to be regular meal replacers but rather an extra element to your breakfast. Have one alongside your pancakes or frittata! Put all your ingredients through a juicer and serve over ice. If you don’t have a juicer, blend in a processor or smoothie maker and pass through a sieve over a bowl. Recipe extracted from Milly’s Real Food by Nicola ‘Milly’ Millbank, published by HQ, HarperCollins, 4th May, £20. Photography: Susanna Blåvarg.